The Sanskrit word siddha means accomplished or adept, one who has attained the highest. The name implies the attainment of a perfectly stilled mind and the experience of peace that results from meditation. The siddha-asana is a recommended pose for meditation. The siddha-asana is complicated to describe but is actually one of the simpler sitting postures. It requires less flexibility of the legs than the padma-asana yet it facilitates relaxation, concentration and ultimately, meditation. 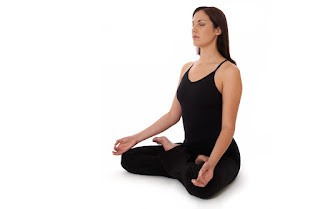 Begin in a seated posture. Bend the left knee and grasp the left foot with both hands and place the heel against the perineum and the sole of the foot against the inside of the right thigh. Exhale and reach down and loop the forefinger of the right hand around the big toe of the right foot and grasp the left foot with the left hand. Bend the right knee, grasp the right foot with both hands and place the outside edge of the right foot where the calf and thigh of the left leg meet, right ankle over left ankle. The heel of the right foot should line up approximately with the navel and be as close to the pubic area as possible. With palms up, place the hands on the knees, form a circle with the thumb and forefinger and extend the remaining fingers straight ahead. Siddha-asana helps to establish an equilibrium throughout the body/mind. It will also help stretch the legs and pelvic area to the point where the padma-asana can be held effortlessly. Either posture, by creating a firm foundation with the legs locked in a crossed position and the spine held straight and motionless, awakens the attention and helps cultivate concentration. When concentration is highly focused and undistracted, meditation follows.